Canine Cabins offers a less stressful alternative to traditional boarding. Nestled in the woods of Ohio Township, Canine Cabins is a true retreat for dogs. Luxury facilities and one-on-one attention makes Canine Cabins the place to send your dogs on their own vacation. Enjoy your time away knowing your pooch is safe and well taken care of, while getting exercise and having fun with friends. We have twelve suites, each with its own private patio. Each suite is plenty big enough for an English Mastiff or two Golden Retrievers. We let the dogs out early and put them to bed late, giving them lots of love and playtime in between. We welcome you and your dog to sniff around and check out the facility, by appointment only please. Canine Cabins is run by Avonworth graduates Julie Kramer and Bill Homol. Julie and Bill live on the property with their Landseer Newfoundland, Finnegan, Bernese Mountain Dog, Huck, and their cats Wink, Boo and Taz. When we’re not with the dogs we can always look right out the window to check on them! Please check the reservations tab for a description of what Canine Cabins has to offer, our pricing and vaccination requirements, then check with us for availability and to set up a visit. Our FAQ can also answer any additional questions you may have. 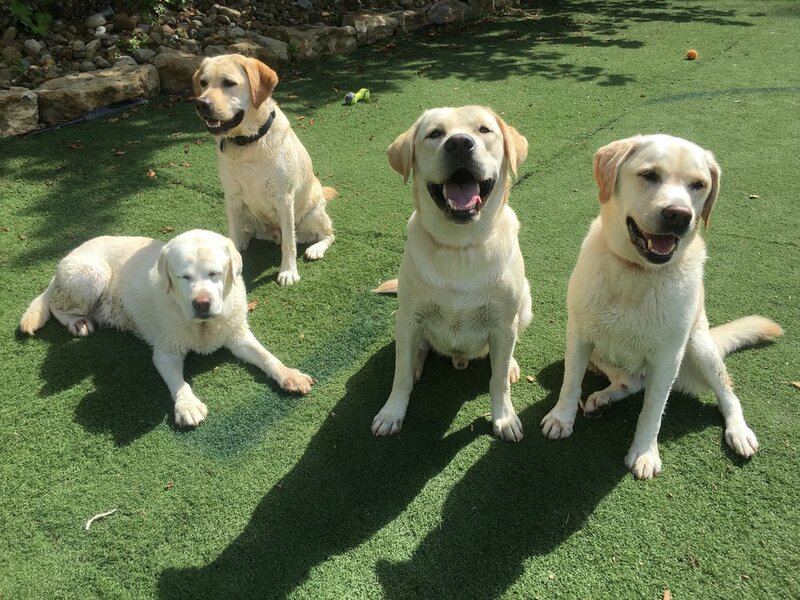 Our facility is set up with a focus on group play, so your dog must be friendly with people and other dogs, socialized and up-to-date on all vaccinations. All dogs over 1 year must be spayed or neutered. Ready to see for yourself what makes Canine Cabins so special? View the gallery of our rooms, play yard, water features and of course a ton of dogs having fun on vacation!